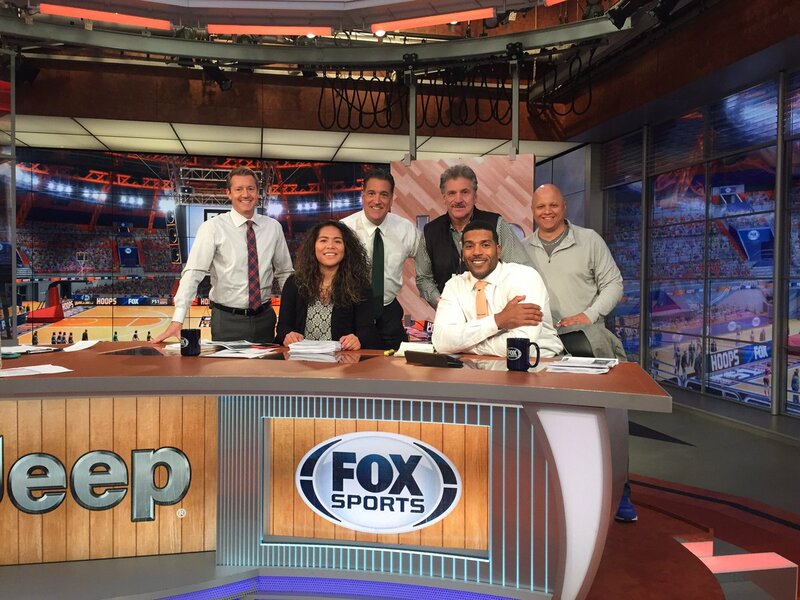 Women's guard Serafina Maulupe spends Dec. 17 job shadowing the Fox Sports studio staff. Photo provided by Nick Lopinto. Redshirt junior Serafina Maulupe hustles for a loose ball against Cal Poly on Jan. 21. Maulupe finished with a team-high 25 points. Photo by Paul Trafecanty/CSUN Athletics. 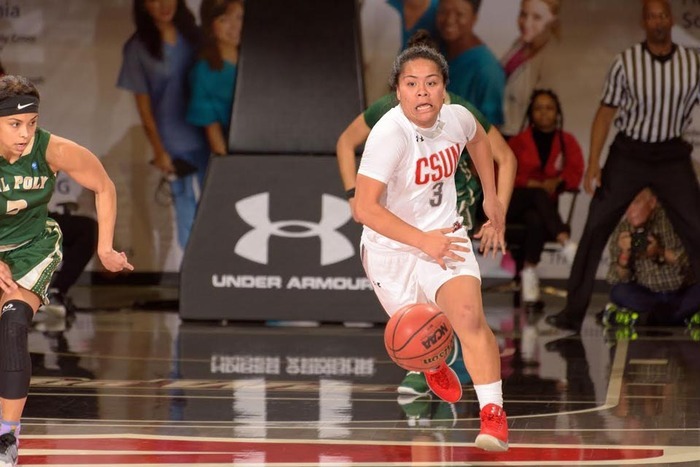 California State University, Northridge women’s basketball guard Serafina Maulupe has been on a scoring spree during the month of January, putting up 53 combined points in the past two games alone. After putting up 25 points against Cal Poly on Jan. 21 and a career-high 28 points in a win against UC Santa Barbara on Jan. 25, the senior was named the Big West Player of the Week. Maulupe — averaging 13.1 points per game and leading the team with 50 three-pointers as of Jan. 25 — and Channon Fluker, last season’s Big West Conference Freshman of the Year, have provided the Matadors with an explosive one-two punch this season, combining for more than 40 percent of the team’s scoring output. Maulupe, who transferred to CSUN after spending one season at Virginia Tech, sat out the Matadors’ most recent Big West championship in 2014-15 because of NCAA transfer rules, which states that transfer students must sit out one full season. Now playing a vital role, Maulupe’s goal is to help capture another Big West championship — and to win at least one game in the NCAA “March Madness” tournament. Just like her goals on the court, Maulupe also has big plans off the hardwood. Maulupe, who expects to complete her bachelor’s degree in journalism in May, said she plans to pursue a master’s in humanities at CSUN and then begin a career in sports broadcasting. Maulupe, who is of Samoan and Filipino heritage, credited her parents and coaches for motivating her throughout her academic journey. On Dec. 17, 2016, Maulupe got her first taste of life as a sports broadcaster when she was given the opportunity to go to the Fox Sports studio and “shadow” many of the show’s staff, including former UCLA men’s basketball coach Steve Lavin. Lavin, who coached Flowers as a player in 2000-01, is now a studio analyst and broadcaster for Fox Sports and the Pac-12 Network. Playing overseas, especially in Europe or Australia, is something Maulupe hasn’t ruled out, but the 21-year-old said she wants to keep her options open.